The next social-media campaign you interact with just might be the work of real children. At Thomas R. Pollicita Middle School in Daly City, the nonprofit Designed By Youth is teaching middle school students how to do the work of Web designers and social-media consultants, turning the children from passive Web consumers into active users who ran an advocacy campaign for a City Council member. Jason Dare, who owns a for-profit education company, created the program at Thomas R. Pollicita Middle School because the school serves many disadvantaged students, some of whom struggled with low test scores. A year ago, when Dare started the program, he began by sending the students on an online scavenger hunt. He was surprised to see the kids typing the scavenger hunt's written instructions, verbatim, into the Google search field. Upon further investigation, Dare found that the students didn't know what a sponsored search result was. He said that none of them had blogs or used Twitter, but most of them did watch videos on YouTube. In other words, he said, the kids had been relating to the Internet as a source of entertainment that they passively consumed. Mike Guingona is on a quest. The City Council member and former mayor is bicycling across all 117 miles of Daly City's public roads, and he wants you to come along for the ride. He launched his Bike With Mike campaign to promote bicycling, raise awareness about health issues and inspire people to be more active. 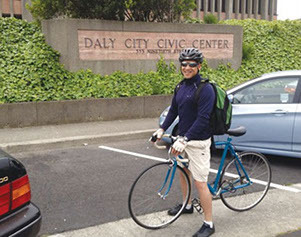 However, as he methodically pursues his goal in small, daily increments, Guingona is also making firsthand observations about the state of bicycle infrastructure in his community. "I'm looking at what we have," Guingona said. "I have a map of existing and proposed bike routes, and I'm doing my own assessment." Guingona's trek is also being publicized with the help of the nonprofit Breathe California and Designed By Youth, a nonprofit organization that teaches tech skills to students at Thomas R. Pollicita Middle School. The students designed a logo and social-media campaign for Bike With Mike. "One problem we saw was that it was going to be a lonely road for him," said Designed By Youth founder Jason Dare. "So the students said, 'Let's make Mike a website, postcards, stickers and other media.'" The students asked Guingona to carry a GPS device so his progress could be tracked on Facebook and Twitter. They also recently hosted an event at Serramonte Shopping Center where they gave away Bike With Mike-themed reflective safety stickers and coloring books. Daly City, meanwhile, is planning to install three miles of bike lanes this year using funds from the regional One Bay Area Grant program. 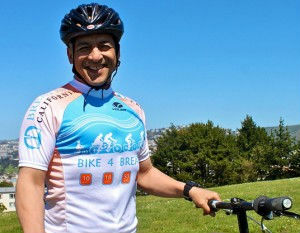 Mike Guingona, a Daly City council member and former mayor who regularly bikes to his job as an attorney in San Francisco, is organizing community bike rides using his new “Bike With Mike” Facebook page. 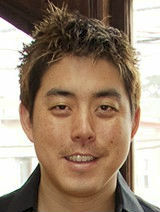 He’s also taken on the challenge to bike all 117 miles of Daly City’s streets.